Northiam, Rye, East Sussex, TN31 6PH. 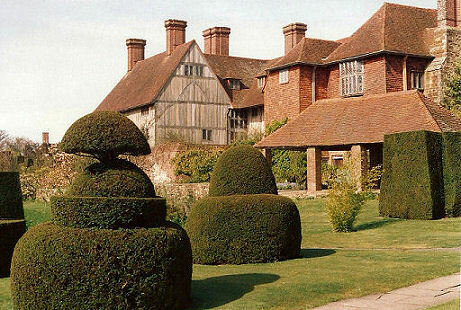 Two things first about Great Dixter are that it was owned and worked in by the famous garden writer Christopher Lloyd and that he was not over keen on Topiary! People old enough to be familiar with his work in “Country Life” and other publications will know that first and foremost he was a keen plantsman. Indeed it was his ability to tear out plantings and invent bold new designs every season or so, which kept people coming back for more and this tradition still holds good in the garden. The building is a Fifteenth Century Manor house, but it was Christopher’s father who was responsible for laying out most of the gardens in 1910 as we know them today. Nathaniel Lloyd was keen on architecture and asked the famous architect Sir Edwin Lutyens to extend the house for the family and have a hand too in the garden. 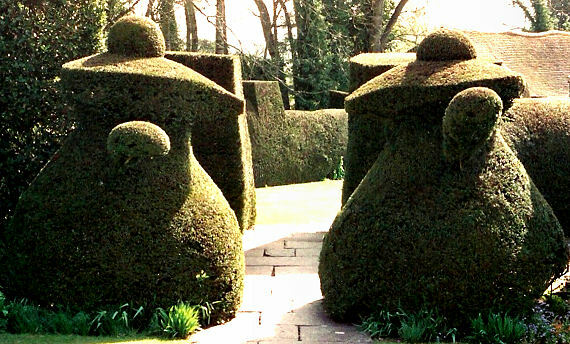 That he was also interested in the architectural properties of Topiary is obvious. One of his own written works was called “The Adventurous Gardener” and he was also to write much about the virtues of Box. 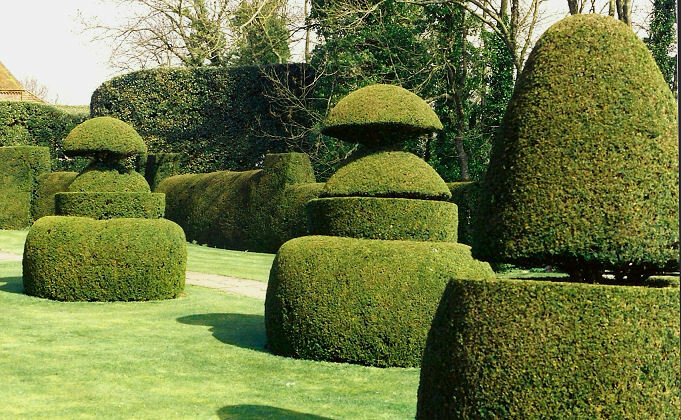 As I’ve said Christopher did not get over-excited by Topiary but he certainly was no vandal and he and hisstaff kept the existing specimens in perfect shape. His only proviso was that if a specific tree finally died he would not replace it, but there is so much to see at Dixter that you won’t notice one or two missing pieces. Talking of vandals, some deranged person entered his garden in the dead of night in March 2001 (just before Christopher’s 80th Birthday) and caused £100,000 worth of damage. Several of the Topiary pieces were damaged by having branches deliberately sawn off and there was also much other damage to the other planting. Never mind, the Yew trees will grow back defiantly, which is more than can be said for the soul of the unfortunate miscreant who did the deed! Must see amongst the Topiary are the stunning Mustard Pots. If you get time too, have a look inside the House which has a Great Medieval Hall and a seemingly ever burning log fire.